This is one of the small sketches that I’ve included in the exhibition at Blairmore Gallery near Dunoon. 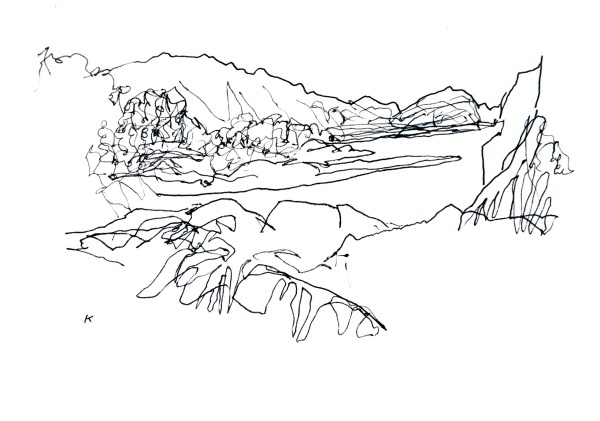 It is one of the drawings I did while staying in Achmelvich in Assynt in May 2009. We’d taken the footpath that leads across the headland to Lochinver but then came across a small path leading off in the direction of the sea. It led by a secluded little loch that was surrounded by crags (one of many in this area). The path led after a short distance to a small hut near a rocky shore. What a fantastic place….so out of the way, so unspoilt. << Previous Post: Back out again …at last!